The Royal Academy of Arts has said a cast of JMW Turner's death mask, one of its most important treasures, may have been stolen. Staff have not seen the 152-year-old mask since the mid-1980s, and it had been thought it had been mislaid. 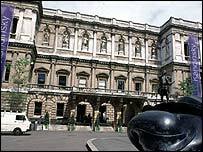 But now the London institution has informed the Art Loss Register - a database of stolen works - about the mask's disappearance. A Royal Academy spokeswoman said it was confident the mask would be found. The loss came to light following a request to borrow the mask in 2002. Staff found it had last been recorded 17 years earlier, when it was moved between store rooms at the academy's base at Burlington House, Piccadilly. There has been no sign of the mask since then, and until now the academy has said it may have been mislaid or borrowed by a forgetful teacher or student. The academy said in a statement it took "the loss of works from its collection extremely seriously". A spokeswoman told BBC News Online: "We're confident the mask will be found, but we have to consider all the possibilities." The academy, which was founded in 1768, is hoping the mask will be tracked down as it works on cataloguing its 17,000 artworks, a process which will be completed in 2007. JMW Turner was one of the academy's most distinguished pupils, and went on to teach at its schools. He was also one of its greatest benefactors - leaving the academy £20,000 upon his death in 1851. The mask was taken from a mould - since lost - made after he died. A second cast of the mask survives, and is owned by the National Portrait Gallery. Over 240,000 people visited the Royal Academy's recent exhibition of of paintings from Andrew Lloyd Webber's collection, it has announced, making it one of the academy's most successful exhibitions of recent years. The exhibition, which closed on 12 December, displayed over 200 works by Pre-Raphaelite and other masters from the composer's collection.